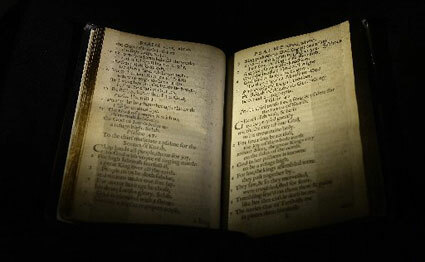 The first book written in what is today the United States of America fetched $14.2 million in New York on Tuesday, becoming the world’s most expensive printed book sold at auction. The translation of Biblical psalms “The Bay Psalm Book” was printed by Puritan settlers in Cambridge, Massachusetts in 1640 and sold at a one-lot auction in just minutes by Sotheby’s. Bidding opened at $6 million and closed swiftly at a hammer price of $12.5 million, rising to $14.165 million once the buyer’s premium was incorporated. The book, with its browning pages and gilt edges, was displayed in a glass case behind the auctioneer to a relatively small crowd which attended the less than five-minute auction in person. The settlers, who came to America to seek religious freedom, had set about making their own preferred translation from the Hebrew original of the Old Testament book after arriving from Europe. Sotheby’s named the buyer as David Rubenstein, the billionaire American financier and philanthropist. He was in Australia and his bid was conducted by telephone. Sotheby’s had valued the book at $15-30 million, but denied any disappointment in the sale price reached Tuesday. The world’s most expensive manuscript, the handwritten Codex Leicester, 72 pages of largely scientific writings by Leonardo da Vinci, was bought by Bill Gates in 1994 for $30.8 million. Sotheby’s said it was delighted to have set a new world record for any printed book at auction with the $14.165 million price tag. The previous record was $11.5 million, reached when a copy of John James Audubon’s “Birds of America” sold at Sotheby’s in December 2010. “We’re very, very pleased about this purchase,” said David Redden, auctioneer and head of Sotheby’s books. Rubenstein plans to share the psalm book with the American public by loaning it to a number of libraries around the country and placing it on long-time loan to one of them, Redden said. “If you recall David Rubenstein also brought the Magna Carta from us back in 2007 for the same reason, to make sure Americans would understand the significance of their heritage,” he added. The Magna Carta sold for $21.3 million in New York. It was one of only 17 existing copies of the 800-year-old English royal manuscript setting out the rights of man. Redden said “The Bay Psalm Book” was a “great rarity” and that only two of 11 surviving copies had come to sale in 100 years. “It’s very important because of its story. It’s the first book printed in America and the first book written in America,” Redden told reporters. Before the sale, Redden said the volume had even greater significance as a precursor to Lexington and Concord, and, ultimately, to US political independence. “With it, New England declared its independence from the Church of England,” he said. There were 1,700 copies of the original 1640 edition. The eleven that have survived are in collections such as The Library of Congress and Harvard College Library. No copy had previously been auctioned since 1947, when a different copy fetched $151,000 — a record at the time for any book, including the Gutenberg Bible or Shakespeare’s First Folio.